Even though its shareholding in SsangYong was sold long ago, Daimler retains links to the Mahindra-owned maker of mainly SUVs. Not only does the just-updated Turismo gain a new Mercedes-Benz transmission but Daimler’s W124 platform, albeit much modified, remains the basis of this big MPV. The first thing anyone comments on with what the UK importer sells as the Turismo is its looks. Somebody kind might describe the overall presence as ‘daring’, other, less charitable observers would see things differently. Considering that the Turismo first went on sale in 2004 and that there have been multiple facelifts, this, sadly, could be the last redoubt of whacky looking Korean cars. What everyone would find the middle ground on to agree with is just what a bargain the Turismo represents, with prices starting at GBP20,495. Even a fully loaded ELX model grade comes in at only GBP26,745, which a lot less than the equivalent Volkswagen Caravelle, Vauxhall Tourer Elite and Combi Plus or Citroën SpaceTourer. The UK’s SsangYong importer continues to see falling sales (down 25% in July). The addition of the new Musso, and now a revised Turismo should mean things begin to improve soon, especially as the 68 registration plate change happens in three weeks’ time. As was pointed out during the media launch of the new pick-up, there is also now a stronger focus on profit and brand-building. There are various names for what we in Britain have as the Turismo. The model for the South Korean market was first seen there as the C.E.O. concept, this prototype having been revealed at the Busan show in October 2003. Developed with the project code of A100, ‘Rodius’ has mostly been the home market’s model name, with Stavic, Turismo and/or Korando Turismo also used in various countries. The platform comes from the former SsangYong Chairman, a large sedan built between 1997 and 2014. The basis for that car was the Mercedes-Benz W124, an E-segment sedan and wagon model range sold for more than a decade from the mid-1980s. That was the one with the differently-shaped exterior mirrors and a single wiper which ‘reached out’ to the corners of the windscreen. Variants included the 200, 250D, 300D, 300E and 500E. The original Rodius, on sale worldwide from 2004, had a standard 165bhp 2.7-litre five-cylinder Mercedes diesel engine. South Korea was the model’s first market, the sales release taking place in May 2004. The platform was adapted for all-wheel drive capability, these versions following three months later. The latest Turismo can still be ordered with a part-time 4WD system, traction to the front axle being activated by a switch to the left of the driver’s door. Owners can even go off-roading as there is a setting for low-range. That might seem bonkers but in snowy conditions, it could be the difference between being stuck and getting mobile. The European debut of the A100 original was at the Bologna show in December 2004, with sales starting across the EU during the following April. Right-hand drive versions for the UK arrived in June 2005. The first facelift took place in July 2007 for the South Korean market. There were a couple of other minor updates over the following years. Then came what was claimed to be a new model. This was released in the home market during February 2013. As well as fresh engines and an updated architecture, the name changed in many countries from Stavic or Rodius to Turismo or Korando Turismo. The codename was also new. The A150 series model had its motor show premiere at Geneva in March 2013 badged as the Rodius. Sales in the UK, which remains the vehicle’s main RHD market, commenced in August 2013. Depending on the country, engine choice consists of 2.0-litre diesel, 2.2-litre diesel and 3.2-litre petrol units with interior layouts of seven, nine or eleven seats. In Britain, there are six-speed manual or seven-speed automatic options for the sole engine, which is a 178PS 2.2-litre diesel. A seven-seat layout is standard for all three model grades: SE, EX and ELX. Four-wheel drive is reserved for the ELX variant and automatic transmission is standard too, as it is for the EX. As the cost of building it at the Pyeongtaek factory in South Korea is minimal, the Rodius/Turismo will most likely be profitable. Of the 1,846 registered worldwide between 1 January and 31 July, 1,400 were sold to buyers in the domestic market. The UK took 280 of the remaining 446 vehicles which were exported. SsangYong will probably keep building this vehicle until demand falls away significantly but for now, the company can clearly live with annual production of between 3,000 and 3,500 units. Were that not the case, the latest facelift would never have happened. This took place in January, with the updated Turismo announced for the British market in late July. SsangYong might still not be making money, but at least its worldwide sales keep rising. In South Korea, the brand’s number one market, it is now the number three make ahead of Chevrolet and Renault Samsung. A new record was set in July too. The Tivoli is the main reason for that, as well as stumbles by its far larger rivals, although the arrival of ever more new or facelifted SsangYongs is also proving to be very helpful. The new Musso in particular is much in demand. Guess what happens if you try to push this top-heavy minibus too hard? Nothing dramatic in fact. I was expecting the Turismo to feel fairly dodgy at higher speeds and there was no way I wanted to attempt an elk test-style lane change. The electronic safety tech which SsangYong is obliged by the EC to fit as standard in EU countries means drama-free driving, even should the unexpected happen. Just like any Land Rover with pneumatic springing, long corners taken at speed in the Turismo bring lavish lean. Then though, just as in a Discovery, Range Rover or RR Sport, the tilt reaches a point where it seems to stop. In the Land Rovers, that’s down to some especially sophisticated chassis engineering. In the SsangYong, it’s because you really don’t want to practise reckless abandon when driving a vehicle which has such an obviously high centre of gravity: it may not remain wreckless. The sheer weight of the low-mounted engine and four-wheel drive system though, tend to keep the tyres on the tarmac: you would have to be a total numpty to make a Turismo turn turtle. Motorways are pleasantly peaceful, something which demonstrates the fact that SsangYong has never stopped trying to improve the Turismo. That it weighs more than 2.2 tonnes isn’t all down to a steel platform, four-wheel drive and many square metres of glass. There is surely a fair amount of noise-baffling material inside pillars, above the vast headliner and below the floor. Whatever the case, the levels of engine noise as well as road and wind hum is lower than what I thought each would be, and perfectly fine for even a long country-crossing trip. Pace isn’t a strong-point, mind, as even with just the driver present, the top speed is only 108mph. That’s for automatics; the manuals will reach 116mph. SsangYong quotes CO2 emissions of 189 (manual SE, manual EX), 196 (automatic EX) and 205g/km (automatic 4WD ELX). Combined fuel consumption averages vary between 39.2 and 36.2mpg. Driven more than 300 miles in conditions which included a lot of cold-engine starts, motorway journeys and low-speed city trips, the ELX returned 33mpg overall. The space inside this vehicle never ceases to amaze. It’s no wonder there can be an eleven-seat layout in South Korea when you see how munificent the leg and head room levels are inside the UK’s seven-seat Korandos. And luggage space? Almost ridiculously generous. These are clearly key factors in this vehicle having a cult-like following amongst taxi drivers. Another bonus for potential owner-operators: the tailgate is much easier to pull closed than the Mercedes-Benz Vito Tourer’s. It’s a pity that the SsangYong does not offer any form of front-end parking assistance, which is needed as the edge of the bonnet isn’t visible from the driver’s seat. That’s especially odd as the rear-end is looked after by a camera. Overall, the Turismo is spectacular value for money, has good roadholding, is ridiculously roomy, perfectly put together, and not at all bad to drive either. 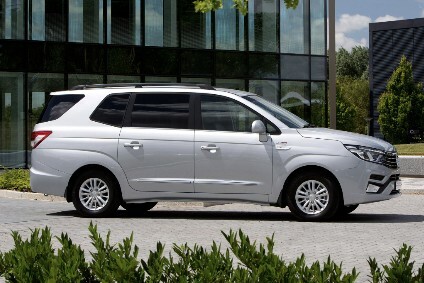 Will SsangYong replace the Turismo? Given how small the sales volume is, this model probably won’t be directly replaced. Instead, SsangYong should use a large SUV to cover the Turismo’s end of the market. This will likely be an extended wheelbase version of the Rexton. Creating such a model will also lower the current level of complexity at the company’s only manufacturing plant. Almost unbelievably, SsangYong presently builds front- and all-wheel drive monocoque platform SUVs (Tivoli, Tivoli XLV and Korando), a pick-up (Musso) and an SUV (Rexton) with a rear- and four-wheel drive ladder-frame construction, plus the rear- and four-wheel drive monocoque Turismo – all on a single production line. The company hasn’t exactly been drowning in money throughout its history, which is why engineers have had to come with all manner of clever ways to preserve cash not just in the design, but also the manufacture of SsangYong vehicles. Gradually, the long era of large losses is coming to an end and that is down to strict controls on spending, as well as a hands-on approach by Mahindra. The companies are steadily sharing ever more technology and manufacturing alliances. SsangYongs will be increasingly assembled at M&M factories in India with Pyeongtaek remaining the lead plant and supplying Knocked Down kits. Several of the next SUVs for the Mahindra brand will all have strong links to SsangYong, the first of these being the imminent XUV700, which is a Rexton with a new name. This will be followed by a small SUV codenamed S201. That one is due for release in India in early 2019. It will draw heavily from the Tivoli, with the length shortened to sub-4,000mm point so as to slip below a GST threshold. These two come after the recently announced Marazzo (codename: U321), an MPV a couple of sizes down from SsangYong’s only such model. More or less the same engines will be seen in both brands’ vehicles too, as the Bharat Stage VI emissions standard is enforced from 2020. That will bring India ever closer to the mandated levels for China, the EU, North America, Japan, South Korea and other major markets. SsangYong is already planning to add new co-developed 1.2- and 1.5-litre petrol engines to certain existing and future models. The smaller of the two is said to be coming for a facelifted Tivoli in 2019, and the latter will be for the next Korando, also due for release next year. Mahindra will be fitting both to its own crossovers and SUVs, while a new family of four-cylinder diesels for the 2020s is also surely something that both companies are planning to collaborate on if they aren’t already.